Great photo-reserch! Love them all, specialy the firts one, totaly inspiration!! i love that last picture! those rings are adorable!! Gorgeous inspiration. 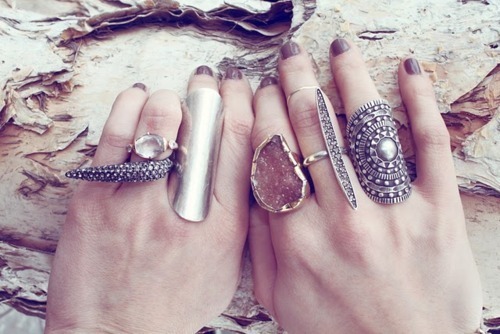 I love the skull and stone rings. THe claw ones might be a bit much though. i love the third photo, with those stones rings! wow I love all of those rings!!! Great blog! I am glad I came across it. Oh, que bonito tu blog, el diseño es muy cuqui! I´m obsessed with costume jewelry and cocktail rings, and these photos are so inspiring! Wonderful! Thank you for your lovely comment! Gorgeous blog, particularly love this post - loving the beautiful costume jewelry that is around at the moment. You've captured some great pieces. Following :) Looking forward to your future posts!